One of the newest types of processing is wireless terminals. If you are going to be at a location where you cannot feasibly use any other solution, then it may be possible to do the transactions with a wireless terminal. Verifone VX 610 Wireless Terminal - Built in Printer! VeriFone's PCI PED approved and RoHS-compliant* Vx 610 is a wireless solution that delivers blazing performance, high-end functionality, and exceptional ease of use - without tying customers to a fixed location. 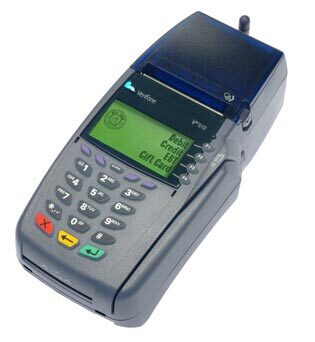 The Vx 610 is powered by a 32-bit processor, so it swiftly handles even the most complex mag-stripe or smart card transactions, using a choice of the latest wireless technologies, such as GPRS, CDMA and Wi-Fi. And its modular design provides true investment protection, allowing modules to be easily swapped should new versions of a technology emerge. The Verifone VX 610 terminal offers a complete transaction solution in one compact package. It's a combination POS/EDC terminal with a quiet, quick-loading thermal printer. It comes with an integrated pin pad and optional smart card reader for added efficiency, convenience and security. It supports your need to stay organized, keep track of transactions and remain in the know by generating reports that can be easily customized to help you manage your business your way. That's what Lipman solutions are all about: enhancing the consumer transaction experience every step of the way. We also have another wireless credit card machine available if this one doesn't suit your needs. *The above rates and fees are not meant to be entirely inclusive; other fees may apply. Please refer to our online pricing page or the full fee schedule in the application.